I’m intrigued about what comedians have to say on the subject. I also find myself fine with listening to them them talk about poop because they’ll likely make me laugh. What I find myself disgusted by however, is the ‘clever’ brown poop smear overlay that appears with each speakers name in this trailer. Clearly talk is one thing, but seeing is something else entirely. Initially, based on the The Secret Life Of Pets trailers, I was certain that I’d identify most with Chloe, but then I saw just how much of a badass the cute, fluffy Pomeranian Gidget is. I’m sure I’m not ‘reaching’ too hard here but my own name does start with a G, so you know. Now that you agree about how much Gidget and I have in common, lets move on. I’ve seen plenty of Kevin Hart’s stand up comedy which makes me familiar with his very recognisable voice. I wasn’t sure that his voice was the best fit for a cute fluffy and gangster white rabbit. However, considering where the story goes, I see why he was chosen. I barely forgot that I was listening to Hart deliver his character’s lines but I enjoyed the story so much that it didn’t remove too much from the good time I most certainly had. I adore the cute animals, especially Max, Gidget and Tiberius. I particularly enjoyed Louis C.K.’s voice work. 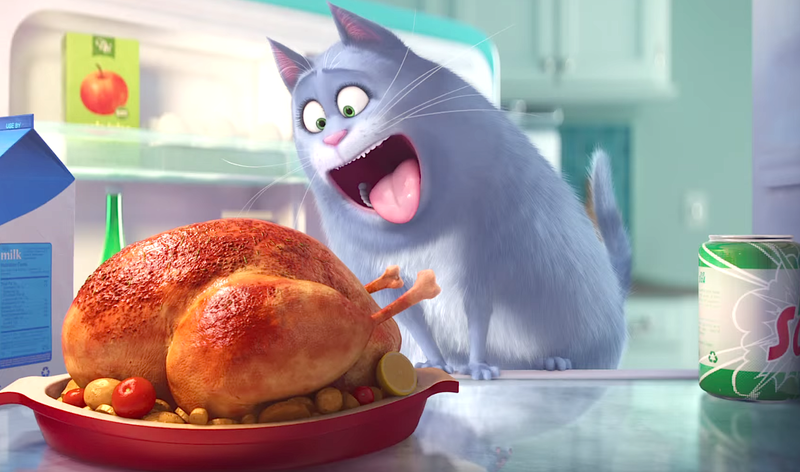 The Secret Life Of Pets is fun, funny and very, very cute. So watch it. You loved the teaser trailer for The Secret Life of Pets, Now it’s time for a character trailer, featuring Kevin Hart as ‘cute little bunny’ Snowball. What do you think..? I definitely found the first trailer more amusing. I’m also not sure that Kevin Hart sounds quite right as the voice of Snowball. But of course, we shall see once the movie arrives.